For the last few year, the month of June has been a tormentor for all those whose wards clear their Class XII examinations. It is sad to see that that instead of being happy and excited about getting into College for an undergraduate course or a professional course, there is an ever growing number of parents and students who go through harrowing times with hardly sure of getting accepted in a college of their own choice for the courses they would like to pursue. The reason is simple –the rapidly growing gap between demand and availability of undergraduate seats in Delhi colleges. University of Delhi has lived up to the expectations, yet again. Sadly, the area where the university has been most consistent in managing expectations is sky high cut offs which leave a sour taste even in the mouth of high scorers. This time, the trend set by SRCC of 100% score for admission has been followed by three more colleges. Acharya Narayan Dev College, Atma Ram Sanatan Dharma College and Shyama Prasad Mukherjee College have pegged the cut off marks at 100% for admission to B.Sc. honours in Computer Science. With around 2 lakh students passing out their class XII examinations from Delhi every year and another lakh plus students applying for admission in various undergraduate courses in Delhi colleges, the opportunities for affordable higher education for students in the Capital are getting far less and fewer. The combined strength of all universities and government aided or affiliated professional colleges in Delhi would be around 60,000 seats for undergraduate courses. That is just not enough to cater to even the students passing out from Delhi, leave apart lakhs of other youngsters who come to Delhi to realise their dreams of better and higher education. 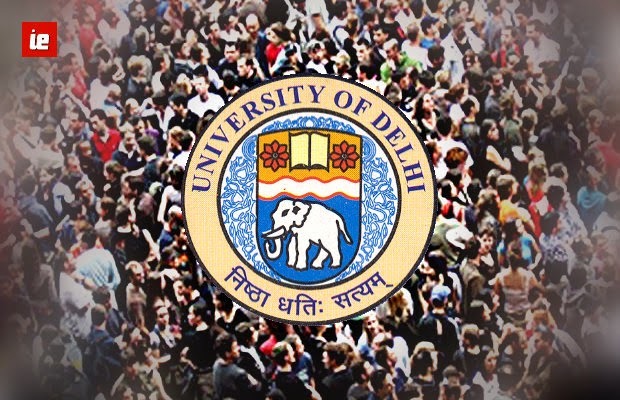 With Delhi University colleges geared up for admissions, rush has claimed that there are not enough undergraduate seats in the College. 2.75 lakh students have applied for the 54,000 undergraduate seats in the 64 DU colleges this year. Out of which only 27,000 seats are for general category. Like previous years,this year too many students,who had scored 90 per cent and above in Class XII,are returned disappointed from the college or courses of their choice. Albert Einstein had once remarked: “Try not to become a man of success,but rather try to become a man of value”. But sadly, success has become synonymous with survival and sustainance in the 21st century. In India the tragedy is even greater we judge sucess by the percentage or marks scored in Board examinations and this yardstick keeps increasing every year,even touching 100 per cent. The Cut Offs are soaring every year but seats in the colleges are stagnant/ has been minimum increased from almost 2-3 decades. In Delhi University Shaheed Bhagat Singh College total of 43 seats are available for BA(H) courses out of which 23 for General Category. In Delhi University Sri Venkateswara College total of 47 seats are available for BCOM(H) for General Category and the seats for BA(H) Programmes are just 19. In Delhi University Ramjas College there are only 31 seats available in popular courses like English (H), Political Science(H) ,Economics (H) . The situation is same in other Delhi University Colleges too. The 23,19,31 seats in different courses get easily filled in 2-3 hours on the first day itself as there are lakhs of aspirants. Hence, There is no option for the second list to come. The university has some lessons to take and the government of India has a bigger role to play if we don’t want to churn out many students who are just seeking degrees, with almost perfect marks but hugely imperfect knowledge and understanding of issues. CBSE is creating more pressure on students by awarding such high marks. The way question papers are designed, it seems CBSE is not serious about assessing students. Exams cannot just be a screening test for admission. It’s time to revamp the system. The 95% club grows every year but the Board hasn’t done anything about it. It’s time to review the system. Interpreting the Data’s(as per CBSE statistics) from 2012-2014.In, 2012 Students scoring 95% & above in Delhi itself was 1,174 ,In 2013 it was 1,857 and in 2014 it was 2,423. Interpreting the Data’s All India from 2012 -2014 Students Scoring 90% & above ,in 2012 it was 28,000 in 2013 it was 44,676 and in 2014 it was 59,591 .It’s clear that the statistics are increasing every year but still the Board hasn’t done anything about it & Delhi University has also failed to balance. For UGC-funded colleges to declare 100% cut-offs. It takes away the right of students to be treated equally. But it’s the short supply of undergraduate seats that makes the high scores and eventually the cut-offs look outrageous. “We made the paper more objective only to reduce subjectivity while checking. The real problem is that the number of seats in DU hasn’t increased even though more and more students from all boards come here to study,” said a senior (CBSE official). Its unfortunate that DU could not keep pace with the ever increasing Demand. The seats are almost stagnant / has been minimum increase from 2-3 decades and situation now is worse than before. The university offers a centralised admission form where students can indicate their choices for streams but not colleges, while colleges admit students based on cut-off lists for different subjects. For Economics, for instance, the number of applications has more than doubled from last year. For Commerce, it has gone up to 80,000 this year from 38,000 last year. On the one hand, private colleges are increasing their seats and launching new campuses. On the other, government colleges have seen no increase in seats, forget about launching new campuses. Private universities have seen demand grow manifiold. At Amity University, the number of applications is expected to touch 2 lakh this year, compared with 1.5 lakh in 2013. It has increased its total number of seats to 14,500 this year,others too have similar trend. It’s a fact that Delhi University Admission is a Luck shot game , as nothing can be predictable in advance we expect 95 its 99.99 and than .99 matters a lot while applying in Delhi University. Around 2.7 Lakh students have applied for admissions in DU this year but only 54000 seats are available. The students who are economically weak don’t get admission in the prestigious colleges given that most of them do their schooling from a government school. Such candidates then have no choice other than turning to SOL. The Main reason for such high cut offs where a 90% student does not get admission of his choice is a matter to be addressed. The main reason is stagnant UG seats in the colleges,the seats are stagnant and demand are increasing. So, Due to high demand and low supply the situation is critical. It’s a need of hour to reform our education policy so that seats in Delhi University colleges must be doubled twice from next academic year. Mayank Maggu an aspirant with 94.5% in CBSE, doesn’t get admission in BA(H) Political Science Course just because he came two hours late from scheduled time of 9 a.m on the first day itself as admission got closed. Hence the statistics says it all, 23 seats in a BA(H) Course is really a matter to introspect. Hence we need to balance the High demand and Low supply situation here. This year’s CBSE Class XII All India topper Sarthak Agrawal is also among the ones who have failed to make it to the first list announced on July 1, 2014. Despite scoring the highest in the examination Agrawal 99.6 per cent his name features in the waiting list at St Stephen’s College for Economics (Hons). Sarthak Agrawal might have become an overnight hero with lakhs of school students and parents praising him for his par excellence performance, but it seems like his academic credentials failed to impress a top college like St Stephen’s. Unfortunately , he didn’t get into college of his choice. The first and the most important things is to expand number of seats in undergraduate courses. This can be done in three ways- first, start evening classes in all morning colleges run by the DU. Second, open atleast 15 new colleges over the period of next three to five years. Third, there is an urgent need to open up an online university which could absorb large number of students who would like to pursue a job or some other professional courses after finishing their school. Simultaneously, we can take certain steps to ensure that students from other states can also enrol with some of the most prestigious institutions in Delhi. For this institutions like SRCC, St. Stephens, LSR College, Hindu College may open their branches in neighbouring states. This would allow many students from other states to study in these prestigious institutions in their own states. It will also reduce the number of applicants in DU from other states and hence provide more opportunities to Delhi students to study in their own city. Thus it could be a win-win situation for all. Delhi has the potential of becoming a world class affordable hub for education. The one occupies the seat of power in the Capital aswell at the Centre will have to play a pivotal role in carrying out all these steps mentioned above as well as many more which would be required to make Delhi the best educational hub in this part of the world & Delhi University accessible . The Centre should Intervene in this matter and respect the sentiments of lakhs of aspirants by at-least doubling the seats twice in the colleges they should set up a committee to view the demand for Increase in UG Seats in DU & Revamp Policy and the recommendations of the committee should be implemented in a time bound manner.